Current job search problems holding back job seekers and suggestions how to get past them. 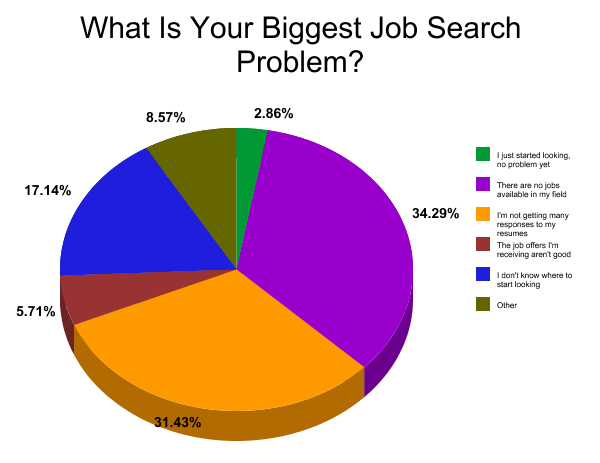 These are the results of our poll about What Is Your Biggest Job Search Problem? This isn't a surprising result to hear as the #1 job search problem people are having in a recession. Mainstream media likes to measure the job market by the number of advertised job openings in newspapers in a given time frame compared to the same period one month/quarter/year earlier. However, that's not a very good indicator because it doesn't take into account that the number of companies also changes during that time, or that companies are also using other ways, like social media, to publish their job postings. My follow-up question is this: I believe you, but how do you know there are no jobs in your field? This is a classic problem whose sources range from generic, non-targeted resumes to recessionary times where companies aren't hiring. Follow-up every resume to confirm that it's getting through. If your candidacy is being rejected, try to find out why so that you can learn and improve your results as you go. If you're sending out too many resumes to have time to follow up after each one, then you're wasting time sending out too many resumes and not targeting them enough. Actually, I expected this number to be higher, considering how many places there are just to find job openings online. Once you know which job you're looking for, contact some people in your profession (such as on LinkedIn) who work in the location you're targeting, and ask them where & how they found their jobs, have they heard of any job openings, and can they recommend specific websites that are currently trendy for industry job postings. Talk to a career counselor or try an online aptitude test. TestQ has some good, free career quizzes. I'm sure more people are feeling this one, especially in a place like Israel where many new arrivals don't speak Hebrew fluently. Although Hebrew isn't necessary for many jobs in Israel, it may be necessary for getting past HR. Focus on local job listings that are in a language you're comfortable in, like English. The language of the job listing will usually be the main language needed on the job. Many Israeli job seekers have complained to me that employers are offering them jobs with ridiculously low pay, using the economic crisis as an excuse. This is an attempt at exploitation, pure and simple, and I recommend you don't take those offers unless you are *absolutely* desperate for income. And if you are desperate, consider taking an easier job at the same pay but that would give you more time to keep on on job searching until you find a better job opportunity. Whoever voted for this last one- sorry to hear about the layoff. Take to heart the other things mentioned here above so you can hopefully avoid these other job search problems. Subscribe to JobMob via RSS or email and follow me on Twitter for the best job search advice on the Web. Could you please tell us, the number of answers it’s based upon? Admittedly the results aren’t statistically significant (they so rarely are, in blog polls), but I think the spread is still meaningful. i heard from an HR advisor that, because of the amount of people looking for each position, the HR personnel has no time to read Cover letters. What about follow up? Guidon- every HR department, placement agency, etc., has their own method for handling incoming resumes. Some of them read each one, some of them use software to filter the resumes for keywords matching open positions in their database, and so on. Since you can’t know how many people you’re competing with, just focus on doing whatever you can to stand out and make sure that your resume does get read and if not, have a good reason why not. Follow application instructions but use loopholes like following up by phone, fax (really! ), or via a common contact on LinkedIn, Facebook, Twitter or any other network.